As small business owners, we have all experienced this before, you have a great idea, get excited, and then nothing ever happens. The great idea gets stuck in limbo with all the other great ideas that collect in the back of your mind. Stuck until you “have the time” or “can get around” to it. Starting a new project for your small business, when there may be several that are already in the back of your mind, can be daunting and frustrating. Here are some quick tips to help you get the ball moving. If it isn’t your area of expertise, talk to your team! This is Why Company Culture Matters, especially in small business. You and your team should be able to collaborate and bounce ideas off of each other. Your weakness may be someone else’s strength. Do not overlook one of the biggest resources you have available. A team member may have an idea on how to get started, may have experience that you never knew of, and may have worked on a similar project. You never know until you ask! Leverage the people that you already have around you, this does not have to be a solo project. Now that you have your team on board and ready to help, start delegating tasks to your team. Assign tasks to the team members that have strengths and skills for those tasks. By setting the team up for success, you will encounter less bumps in the road along the way. Project management tools can help team members communicate more efficiently and keep everyone up to date and in the know. There are several free tools online that can help you get and stay organized. Evernote and Trello are user-friendly and free! As your big idea starts to take shape, celebrate the small victories leading up to project completion. Take a break and observe what is in motion. Watch your team move like a well-oiled machine. This team is working towards bringing your idea to life, so stop and let them know what this means to you. Let them know how their efforts fit into the bigger picture. Taking these small steps will ensure that your big idea comes to fruition. Is your great idea a little bigger than this? Ask us for help! We want to see your great idea come to life and we can put this project together from beginning to end. 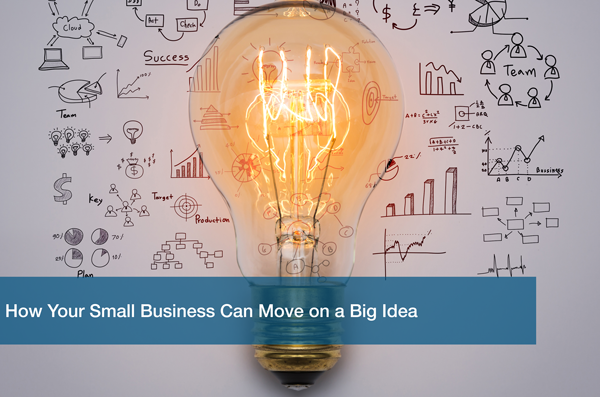 ITC offers more than managed services, like complete project management, to ensure your big idea never gets stuck in small business limbo again. Schedule an IT Analysis with one of our project management experts to find out how ITC can help and take your small business to the next level.